Purpose: The purpose of this retrospective study was to determine whether teeth with furcation involvement lose significantly more bone in furcation sites over time than interproximal sites of the same tooth. Methods: Existing radiographs were analyzed to compare the rate of bone loss between furcation and interproximal sites of the same tooth. Selection criteria included mandibular molars with furcation involvement and a minimum follow-up of 5 years. Using ImageJ software, anatomical landmarks were located and measured corono-apically. Results: Bone level change over time averaged 4.22 % ± 2.49 for interproximal sites and 4.55% ± 2.84 for furcation sites. Significant difference in bone loss was noted in furcation sites between compliant (a minimum of one periodontal maintenance appointments per year) and non-compliant (fewer than one periodontal maintenance appointments per year) sub-groups. No other sub-group variables were associated with significant bone loss. Conclusion: There were no significant differences in bone loss between furcation sites and interproximal sites of the same tooth. Compliant patients lost significantly less bone in furcation sites than non-compliant patients. Periodontal maintenance therapy may provide more effective debridement for mandibular molars that exhibit radiographic furcation bone loss than previously thought. Clinicians are encouraged to expand and explore a non-surgical approach for maintaining multi-rooted teeth with furcation involvement. Few studies in the current literature focus on the differences between the clinical attachment in furcation sites versus the non-furcation, i.e. interproximal sites, of the same tooth. Kalkwarf et al. claimed that even with regular periodontal maintenance, periodontitis in furcation sites progressed at a different rate from other tooth surfaces and that the involved sites tended to lose clinical attachment level regardless of the therapy provided.1 However, it must be noted that these authors evaluated data for probing depth changes in furcation sites only, without reporting changes for the other tooth surfaces. Nordland et al. investigated the probing attachment loss on “non-molar sites, molar flat surface sites, and molar furcation sites” and found that furcation sites had the highest percentage of attachment loss.4 Waerhaug et al. reported in his stereomicroscope study of 34 extracted molars, that attachment loss and marginal gingivitis on surfaces facing the furcation was greater than that on the outer surfaces.13 These authors recorded an average attachment loss of 62.8% on the furcation surfaces and 47% in the interproximal surfaces of the same tooth and concluded that attachment loss was more likely in the furcation sites than on the outer interproximal sites of the same tooth. In their study, Waerhaug et al. estimated the clinical attachment loss based on staining methods used on the extracted teeth and did not assess the amount of bone destruction. Subsequently, Rams et al. reported no significant differences in the risk of periodontitis recurrence between molar furcation sites and molar flat sites, or when compared to other molar sites. They concluded that molar teeth, as a whole, show elevated risks of periodontitis, not molar sites with furcation involvement or flat surfaces individually. At the time of this review, no published information was found comparing the rate of bone loss in furcation sites to the interproximal sites of the same tooth. The aim of this retrospective study was to determine whether teeth with furcation involvement loose significantly more bone in the furcations over time than the interproximal sites of the same tooth. A secondary aim of this study was to determine whether gender, age, interproximal restorations, systemic disease, the periodontal health of the adjacent teeth and compliance with periodontal maintenance care, have an effect on bone loss in the furcations as compared to the interproximal areas of the same tooth. This study was approved by the Institutional Review Board of the University of Southern California (approval # UP-08-00149). Patient record selection for inclusion in the study population was completed by reviewing all available archived paper charts and radiographs at the University of Southern California, Herman Ostrow School of Dentistry. An estimated 7000 patient paper charts were reviewed and searched, up to and including, January 2009 for samples that could contribute a 5-year history and meet the inclusion criteria. Study inclusion criteria were as follows: periapical radiographs of mandibular first and second molars with radiographic furcation involvement (molars with restorations covering the CEJ were only included if the same restorations were present in subsequent x-rays); clear anatomical landmarks allowing for linear measurements to be taken between the fixed reference point (CEJ or restoration margin, fornix) and the radiographic apex; a minimum 5-year history of radiographs; comprehensive information on age, gender, presence of a medical conditions, tobacco use status, compliance with and frequency of periodontal treatment recommendations. Presence or absence of adjacent teeth and the presence of interproximal restorations was noted. Clinical variables including probing depths, clinical furcation involvement, mobility, and clinical attachment loss were not included as part of the data set due to incomplete and inconsistent data collection recorded in the patient charts. Exclusion criteria were as follows: minimal or immeasurable bone loss from the fornix to the alveolar crest in the furcation area; diagnostically unacceptable or unclear anatomical landmarks; excessive image distortion (obvious elongations or foreshortening of the teeth and surrounding structures); presence of infrabony defects; and presence of root resorption or periapical lesions in either baseline or subsequent radiographs. Patient charts with documentation of local antibiotic therapy and/or periodontal surgical treatment, including osseous surgery, root resection, or tunneling procedures performed on the selected tooth during the time frame of the study, were also excluded. Charts selected for the study were included only if the patients had been on a periodontal maintenance schedule including oral hygiene instruction and professional dental cleaning at either the Ostrow USC School of Dentistry pre-doctoral clinic or dental hygiene clinic. The periodontal maintenance regime over the study period was recorded. Patients, who had presented for at least one nonsurgical periodontal maintenance visit per year, were classified in the compliant group. Cemento-enamel junction (CEJ), alveolar crest (AC), furcation fornix (Fx), and root apex (Ax) were identified on the baseline and subsequent radiographs. Linear measurements between the fixed reference point (CEJ or restoration margin) and radiographic apex were made along the root surfaces on both mesial and distal roots using ImageJ.23 The program set the linear distance from CEJ or restoration to the radiographic apex at 100%, denoting the total root length. The linear distance between the apex and AC, as well as fornix and AC were assessed and recorded for each root. Each time a different root or radiograph was chosen the root length was re-measured and set at 100%. The same measurement was repeated on each subsequent radiographic image and recorded. The mesial and distal root surface measurements were not averaged together and were used in the calculation separately from each other. Radiographs were further reviewed to record presence or absence of an adjacent tooth. The condition of having a tooth adjacent to the test tooth surface was referred to as “adjacency” in this study. The means of the radiographic measurement were compared using statistical tests. All p-values were calculated using non-parametric tests. The Wilcoxon signed-rank test was used for differences between interproximal and furcation bone loss. The Wilcoxon rank-sum test was used for differences between subgroups. A p-value ≤.05 was considered statistically significant. Twenty-six sets of periapical radiographs were obtained of mandibular first and second molars (20 first molars, 6 second molars) with radiographic furcation involvement in all 18 patients (Table I). Mesial and distal root surfaces were measured separately and were analyzed individually as sites (total = 56 sites). Demographic characteristics of the study population are shown in Table I. The average age of the patients at the baseline radiograph was 61 ± 9.8 years (range: 41 to 81 years). Patient records were arbitrarily divided into two groups, age 60 and younger and older than 60 (n = 10, age ≤ 60; n = 8, age > 60). Eleven patients had reported medical conditions (hypertension, diabetes, thyroid disease, hypercholestremia, or arthritis). One patient had reported an active history of tobacco use. All patients had received nonsurgical periodontal maintenance therapy; however, the periodontal recall schedule varied from patient to patient (intervals of 4 to 24 months). Following the 5-year study period, the sample teeth in 14 patients were still intact, and 4 patients had subsequently had the sample teeth extracted. The study follow-up time ranged from 5 to 12 years (mean = 6.3 years). Presence or absence of an adjacent tooth and of any interproximal restoration was noted on individual interproximal sites on the radiographs. There were 17 teeth that had either full coverage restorations or interproximal restorations on one surface (mesial or distal), leading to total of 30 sites. There were 37 interproximal sites that were positioned by an adjacent tooth and 15 sites that were adjacent to an edentulous area. Bone loss was compared between interproximal and furcation sites within the same tooth. No significant differences were found between mesial and distal sites of the same tooth; therefore no attempt was made to differentiate them further. In comparing baseline and subsequent periapical radiographs of furcation-involved teeth, the overall average bone loss was 4.22 % ± 2.49 for the interproximal sites and 4.55% ± 2.84 for the furcation sites (Table III). The annual average bone loss was 0.88% ± .61 for interproximal sites and 0.96 % ± .74 for furcation sites (Table II). No significant differences in overall or annual bone loss rates were found between the interproximal sites and the furcation sites. Various parameters were reviewed to detect possible associations between bone loss including age, gender, presence of systemic disease, interproximal restorations, adjacency, and compliance to periodontal recall within 12 months (Table II). Other than compliance with periodontal recall schedule, no parameters were significantly associated with bone loss between the interproximal and furcation sites. A more regular recall schedule resulted in statistically less bone loss over the furcation site (p = 0.04) than in records indicating patient non-compliance with the recall schedule. The interproximal sites showed no statistical differences in relation to compliance. There was a trend for greater bone loss in interproximal sites adjacent to an edentulous area than in those adjacent to another tooth; however, the difference was not statistically significant. Mandibular molar teeth studied in this radiographic analysis using ImageJ software exhibited a natural progression of inflammatory periodontal disease in both furcation and interproximal sites. However, bone loss change between sites was not statistically different. The 4.22% bone loss found in the interproximal sites can be roughly translated as a range of 0.56 - 0.63 mm loss over the study period (5.0 to 6.3 years). 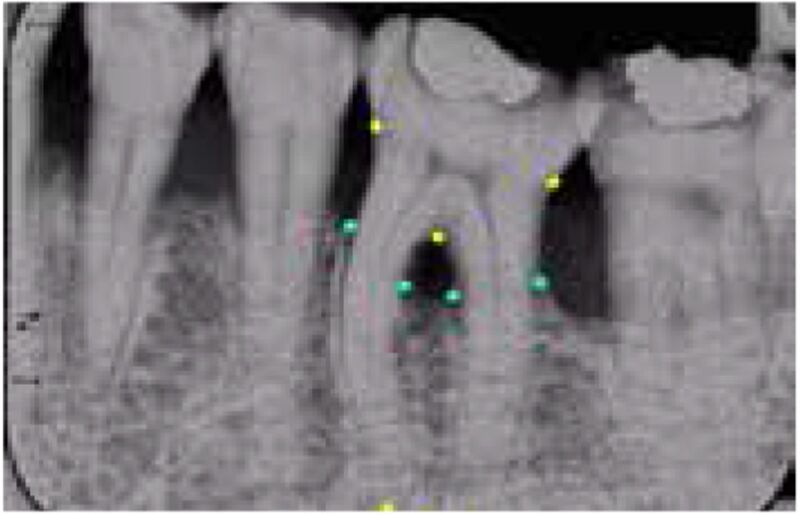 This assessment translates to an estimated annual interproximal bone loss of approximately 0.09 – 0.1mm based on the average root length reported.24 Although this is an estimated rate, it is similar to the reported average annual bone loss in chronic inflammatory periodontitis patients.11, 25-32 No other retrospective radiographic studies analyzing the rate of bone loss in mandibular molar furcation sites versus interproximal sites of the same tooth were found as a comparison to the findings of this study. Additionally, this study did not find significant differences in bone loss between mesial and distal root surfaces or between the first and second molars of the teeth studied. Therefore, no attempt was made to further differentiate between root surfaces or first versus second molars. Several clinical studies have reported more attachment loss over time in furcation sites versus non-furcation sites.1,4,13,33 Differences inherent between clinical and radiographic studies can provide some explanation for divergent findings between this study and other investigations and their significance. While clinically evident inflammatory changes of the gingiva may be considered precursors of periodontal destruction, clinical markers of inflammation may not be indicative of bone loss or necessarily lead to bone loss in the future.34,35 Clinical probing attachment levels may show gains or losses within relatively short periods of time.4 Due to the nature of a retrospective study, clinical information at and following the baseline was inconsistent or absent, and therefore not included in the current study. A limitation of radiographic studies may be that they indicate less attachment loss than clinical studies because of difficulties and inaccuracies related to identifying the alveolar bone crest projected and overlapped in the tooth furcation area. Radiographs in this study were taken as part of patient assessment records, without any calibrated methods. By necessity, investigators had to include radiographs taken at different angulations in this retrospective sample. This study described bony changes in relation to root length, using sequential periapical radiographs with anatomical landmarks as reference points to measure distances. Two reference points, the anatomical landmarks of the cemento-enamel junction and the tooth apex, were used in attempt to minimize error due to angulation differences.36 Due to the retrospective nature of this study, the analysis provided, not absolute, but relative proportional measurements.19,37 Lengths between the furcation to the apex and the interproximal to the apex were calculated and measured separately. Measurements undertaken with use of ImageJ computer software served to minimize the amount of human error in this study. Another reason for differences in these results versus those found in previous clinical studies, may be the inclusion criteria. While most of the clinical studies cited included teeth with Glickman grade I and II furcation involvement, this study sample was limited to mandibular teeth with radiographically detectable furcation involvement apical to the furcation fornix. This allowed analysis of interproximal and furcation sites without the potential dilution of overlapping radiographic tooth images and alveolar bone based on the established root length. Clinical evaluation and furcation classification were not included in this study due to availability and inconsistent data collection. Additionally, this study did not include any teeth with previous surgical treatment, hence observing natural progression of periodontal disease retrospectively. Despite these limitations statistically significant differences were detected after Bonferroni correction. Some clinically relevant conclusions can be drawn and the results may serve as a basis for further research. Future studies using subtraction radiography could detect density differences over furcation areas and decrease the chances of underestimation of bone loss.35,37 Utilization of cone beam computed tomography could serve as another instrument to compare the bone volume over furcation areas. The results from this study indicate that destruction of alveolar bone in furcation sites was significantly greater among the non-compliant group than the compliant group (p = 0.04). This finding is similar to previous studies that have addressed progression of periodontal destruction in non-compliant groups and emphasizes the importance of a continuous periodontal maintenance program in controlling the disease process.7,38 With introduction of power-driven ultrasonic scalers and mini-bladed hand instruments, studies have demonstrated that access in the furcation area is now easier with professional instrumentation.39 Regular periodontal maintenance care and patient compliance in this study was defined as at least one documented recall visit per year, which is considered to be “low threshold”.38 One visit per year is not an ideal interval for a moderate to severe chronic periodontitis population for whom many authors advocate a periodontal maintenance interval of three to six months.40 Maintaining frequent periodontal recall is even more imperative for patients with radiographically evident furcation involvement since definitive treatment is not predictable.1-3 Results in this study demonstrate that even with minimum compliance, periodontal maintenance can influence bone levels in the furcation area. Compared to regular complier patients, erratic complier patients show high recurrence and more tooth loss.41 However, Wilson et al.42 reported that even erratic compliers retain tenfold more teeth than complete non-compliers. Teeth with radiographic furcation involvement may not always be indicated for definitive periodontal surgery. For patients who want to maintain their teeth longer, nonsurgical therapy, even with low threshold frequency, can be an alternative option to minimize the recurrence and progression of the disease. No significant influences of age, gender, presence of the interproximal restorations, adjacent teeth or edentulous areas or chronic systemic diseases on interproximal or furcation bone loss were identified. A limitation of this study was its small sample size; a larger sample size could help detect differences related to presence of restorations and the other selected variables for possible influences on bone loss. Identifying radiographs in patient records meeting the strictly defined inclusion criteria, did not allow for a larger sample size. The majority of the records were excluded because the teeth had been extracted prior to the five year span required for inclusion in the study. The most common reasons for mandibular molar extractions were presence of periodontal abscesses, mobility or caries. Results from this study question the generally accepted idea that disease progression in furcation sites is more rapid than in interproximal sites. As measured by this study, patient records revealed no more bone loss in furcation areas than in the interproximal areas over time and those who were in the category of minimal compliance (n=14) exhibited less bone loss in furcation areas that those who were categorized as non-compliant (n=4). However, this retrospective study protocol cannot answer the question of clinical significance and whether compliance can help extend longevity for radiographic furcation-involved molars beyond five to six years.Future research, utilizing calibrated clinical and standardized radiographic data, to determine periodontal disease progression in furcation sites is needed. The findings of this study of mandibular molars suggest a need for further exploration of non-surgical treatment options for molars exhibiting furcation bone loss. Results from this study imply that professionals, who necessarily have better visual and mechanical access to furcation areas than patients themselves, may be able to provide more effective debridement in furcation areas than previously thought. In this study of the five-year records of eighteen subjects, our findings showed no significant differences in the amount of bone loss between the interproximal and furcation sites of non-surgically treated mandibular molars. This conclusion, coupled with a finding that a minimal threshold of a once-per-year compliance with professional care was associated with less bone loss over time, suggests a professional impact on periodontal health beyond what patients alone can achieve through daily home care and personal oral hygiene. Future long-term studies with larger samples, and study designs that standardize radiographic imaging for furcation-involved molars, are warranted. Clara Kim, DMD, MS completed this research study as a resident in the Advanced Education in Periodontology Program, Herman Ostrow School of Dentistry, University of Southern California, Los Angeles, CA. She is an assistant professor at the College of Dental Medicine, Western University of Health Sciences, Pomona, CA. Sandra Rich, RDH, MPH, PhD is an emerita professor in the Advanced Education in Periodontology Program, Herman Ostrow School of Dentistry, University of Southern California, Los Angeles, CA. This manuscript supports the NDHRA priority area, Client level: Basic Science (diagnostic testing and assessments).
. Evaluation of furcation region response to periodontal therapy. J Periodontol. 1988 Dec;59(12):794-804.
. Calculus removal from multirooted teeth with and without surgical access: (I) Efficacy on external and furcation surfaces in relation to probing depth. J Clin Periodontol. 1993 Jan;20(1):63-8.
. Periodontal and Prosthetic Management for Advanced Cases. 1st ed. Chicago: Quintessence, c1988. Furcation involvement: Periodontic, endodontic, and restorative interrelationships;p. 247.
. The effect of plaque control and root debridement in molar teeth. J Clin Periodontol. 1987 Apr;14(4):231-6.
. Clinical effects of root debridement in molar and nonmolar teeth: A 2-year follow-up. J Clin Periodontol. 1989 Sep;16(8):498-504.
. The influence of molar furcation involvement and mobility of future clinical periodontal attachment loss. J Periodontol. 1994 Jan;65(1):25-9.
. A long-term survey of tooth loss in 600 treated periodontal patients. J Periodontol. 1978 May;49(5):225-37.
. An evidenced based scoring index to determine the periodontal prognosis on molars. J Periodontol. 2014 Feb;85(2):214-25.
. Prognosis versus actual outcome II: The effectiveness of clinical parameters in developing an accurate prognosis. J Periodontol. 1996 Jul;67(7):658-65.
. Prognosis Revisited: A system for assigning periodontal prognosis. J Periodontol. 2007 Nov;78(11):2063-71.
. Periodontal treatment decisions for molars: an analysis of influencing factors and long-term outcome. J Periodontol. 2000 Apr;71(4):579-85.
. The furcation problem: Etiology, pathogenesis, diagnosis, therapy and prognosis. J Clin Periodontol. 1980 Apr;7(2):73-95.
. An evaluation of the reliability of radiographs in the measurement of bone loss in periodontal disease. J Periodontol. 1960 Apr;31(2):143-153.
. A reliable computerized method to determine the level of the radiographic alveolar crest. J Periodontal Res. 1989 Nov;24(6):368-9.
. Computerized methodology for detection of alveolar crestal bone loss from serial intraoral radiographs. J Periodontol. 1992 Aug;63(8):657-62.
. Alveolar bone loss as related to oral hygiene and age. J Periodontol. 1959 Jan;30(1):7-16.
. A radiographic determination of periodontal bone destruction in epidemiological research. Odontol Revy. 1966;17(3):232-50.
. Preliminary observations on the inhibitory effect of tetracycline on alveolar bone loss in beagle dogs. J Periodontal Res. 1979 Jul;14(4):341-51.
. Proximal alveolar bone loss in a longitudinal radiographic investigation. I. Methods of measurement and partial recording. Acta Odontol Scand. 1986 Jun;44(3):149-57.
. A new method for the comparison of bone loss measurements on non-standardized radiographs. J Periodontal Res. 1984 Jul;19(4):434-40.
. Wheeler's Dental Anatomy, Physiology and Occlusion. 9th ed. St. Louis: Saunders; c2009; p. 303.
. The effect of controlled oral hygiene procedures on the progression of periddontal disease in adults: results after third and final year. J Periodontol. 1971 Mar;42(3):152-60.
. Effect of controlled oral hygiene procedures on caries and periodontal disease in adults. J Clin Periodontol. 1978 May;5(2):133-51.
. Subgingival plaque and loss of attachment in periodontosis as evaluated on extracted teeth. J Periodontol. 1977 Mar;48(3):125-30.
. The natural history of periodontal disease in man. The rate of periodontal destruction before 40 years of age. J Periodontol. 1978 Dec;49(12):607-20.
. Comparison of different data analyses for detecting changes in attachment level. J Clin Periodontol. 1983 May;10(3):298-310.
. Progression of periodontal disease in adult subjects in the absence of periodontal therapy. J Clin Periodontol. 1983 Jul;10(4):433-42.
. Radiographic quantification of alveolar bone level changes: A 2-year longitudinal study in man. J Clin Periodontol. 1986 Mar;13(3):195-200.
. Longitudinal radiographical study on the rate of alveolar bone loss in patients of a dental school. J Clin Periodontol. 1983 Nov;10(6):643-51.
. Bone loss of furcated mandibular molars. A longitudinal study. J Clin Periodontol. 1982 Sep;9(5):402-8.
. The relationship between radiographic and clinical parameters in periodontal maintenance in class II furcation defects. Braz Oral Res. 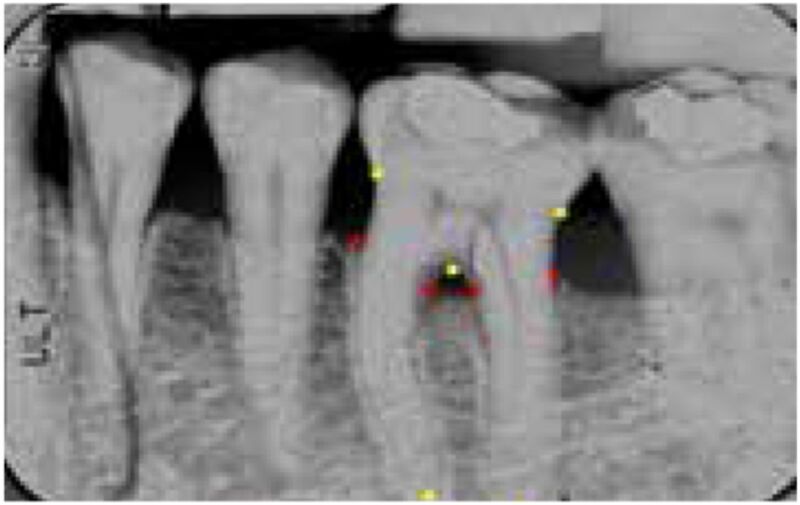 2004 Apr-Jun;18(2):116-20.
. Longitudinal quantitative radiodensitometric studv of treated and untreated lower molar furcation involvements. J Clin Periodontol. 1987 Jan;14(1):8-18.
. A 10 – year retrospective study of periodontal disease progression. J Clin Periodontol 1989 Aug;16(7):403-411.
. Radiographic evaluation of bone regeneration following periodontal surgery with or without expanded polytetrafluoroethylene barriers. J Periodontol. 1996 Apr;67(4):379-85.
. A comparison of the effectiveness of hand scaling and ultrasonic debridement in furcations as evaluated by differential dark-field microscopy. J Periodontol. 1987 Feb;58(2):86-94.
. Maintenance care for treated periodontitis patients. J Clin Periodontol. 1987 Sep;14(8):433-7.
. Periodontal risk assessment model in a sample of regular and irregular compliers under maintenance therapy: a 3-year prospective study. J Periodontol. 2012 Mar;83(3):292-300.
. Tooth loss in maintenance patients in a private periodontal practice. J Periodontol. 1987 Apr;58(4):231-5.